Ann Myers lives in Colorado Springs with her husband, cat, and a large supply of New Mexican chiles. You can follow her at https://www.facebook.com/AnnMyers.writer. Jordyn Redwood, author of Proof, Poison, and Peril, will be speaking to SinC-Colorado members at our next chapter meeting/event on Sunday April 24, 2016 at the Castle Rock Library (Phillip S. Miller branch, 100 S. Wilcox, Castle Rock, Colorado 80104) at 1:30 pm. As an author, have you ever wondered about the correct way to injure, maim or kill your fictional characters? Jordyn Redwood brings over twenty years of emergency and critical care nursing experience as she discusses The Top Ten Medical Pitfalls that authors fall into when they write medical scenes and how to correct them. Strategies are given on how to research those medical details for your manuscript as well. Jordyn is happy to field medical questions that are writing related at the end of her talk. Laura DiSilverio, M.L. Rowland, and Chris Goff are all Colorado Book Award finalists in 2016! For more information, please visit the Colorado Humanities & Center for the Book website. Francelia Belton is a reader, writer and lover of short fiction with her favorite genres being crime and suspense. She was most heavily influenced from watching the old Twilight Zone and Alfred Hitchcock Presents television shows in her youth. Her own stories evoke in the reader feelings of horror, fascination, fear, excitement and intrigue. When she isn’t writing or reading, she’s watching Dancing With The Stars, one of her guilty pleasures in life. A Colorado native, Peg Brantley and her husband make their home southeast of Denver, sharing it over time with the occasional pair of mallard ducks and their babies, snapping turtles, peacocks, assorted other birds, foxes, a deer named Cedric, and a bichon named McKenzie. With the intent to lend her stories credibility, Peg is a graduate of the Aurora Citizens’ Police Academy, attended the Writers’ Police Academy, has interviewed crime scene investigators, FBI agents, human trafficking experts, obtained her Concealed Carry Permit, studied diverse topics from arson dogs to Santeria, and hunted down real life locations that show up in her stories. At this very minute (well, not this very minute) she’s busy turning her standalone books into two separate series because that’s what her readers want. Peg’s third book, The Sacrifice, was a finalist for two 2014 Colorado literary awards. Karen Docter is a 4-time RWA® Golden Heart finalist. She won the 2005 Daphne du Maurier Award for Category (Series) Romantic Mystery Suspense in the unpublished division. She now writes contemporary romance as Karen Docter and romantic suspense as K.L. Docter. She holds a B.A. in Technical Journalism and taught an online plotting workshop for 14 years and college level English composition. Her suspense novel, Killing Secrets, debuted at #8 on Amazon’s Bestsellers lists for psychological women’s fiction. It’s part of the Season of Thrills Box Set: 5 Mystery/Suspense/Thriller Novels by Bestselling Authors, which debuted at #1 on Hot New Releases in Noir Crime in December 2015. Although all of her novels are filled with romance, her suspense is built on the backdrop of danger her characters face in their story…usually because a serial killer is bent on ending one or both of their lives before they can fall in love. Ann Dominguez began her writing career in first grade with a piece of Curious George fan fiction. Since then, she has published in JAMA, The Christian Science Monitor, Medical Economics, The Well, and Venn Magazine. Her medical thriller, The Match, won Best Mystery/Suspense in the Rocky Mountain Fiction Writers’ Colorado Gold contest in 2009. Ann practices medicine in Denver and is not going to tell you who her favorite character in Game of Thrones is, because then he’ll get killed off, too. Becky Martinez, who writes mystery, romantic suspense and romance fiction as Rebecca Grace, is an Emmy award-winning former broadcast journalist. Her latest book, Blues at 11, is the first in a humorous cozy mystery series featuring a television anchorwoman. It is set in the fast-paced, ever-changing world of Los Angeles television, where she spent the majority of her 35-year career. 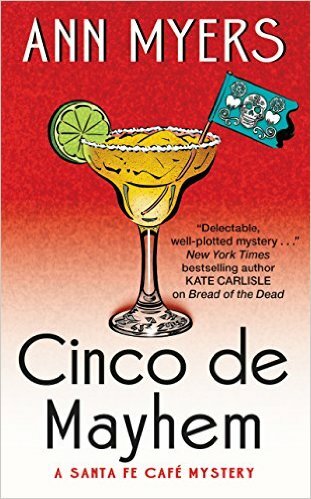 In addition to writing a new Blues mystery, she is currently working on the second book in her Dead Man suspense series, which is set in a fictional town in northern New Mexico. Becky is a two time Aspen Gold finalist and New Mexico Book Award finalist. She also teaches online writing classes and presents writing workshops. She is co-author of several non-fiction writing books, including Let’s Write a Story—Seven Ways to Plot. The latest entry in that series, Creating Memorable Characters, will be published next month. Jools Sinclair is the author of the 13 books in the Forty-Four series and co-author of Whiskey Rain: A Rose City Novella. She loves the outdoors, monkeys, all kinds, and a good story. She usually lives in Bend, Oregon, but has embarked on a two-year road trip with Mr. Jools and has landed in Colorado for a bit. She has one giant Lion Cat, who wakes her up each morning demanding food and pets. 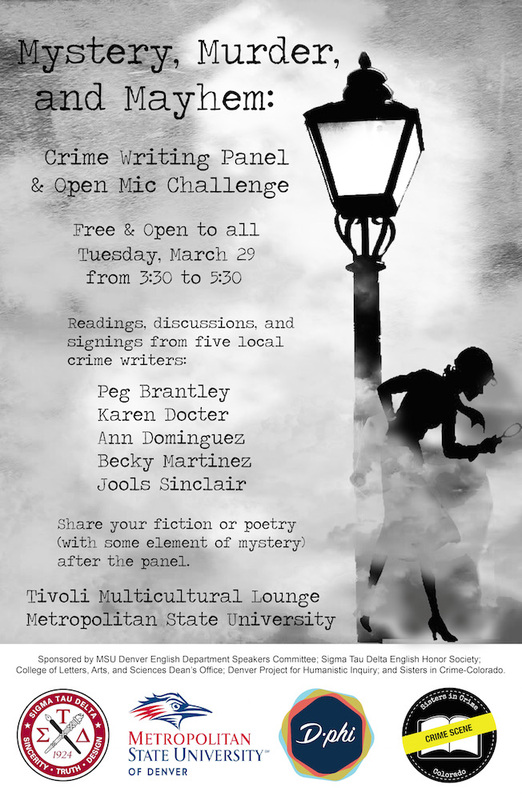 Sponsored by MSU Denver English Department Speakers Committee; Alpha Psi chapter of Sigma Tau Delta English Honor Society; College of Letters, Arts, and Sciences Dean’s Office; Denver Project for Humanistic Inquiry; and Sisters in Crime-Colorado.